Princess Maria Margarita of Borbon-Two-Sicilies died at Madrid on January 15. She was 79 years old. The Princess was the third child of Prince Gabriel of Borbon-Two-Sicilies and his second wife, Princess Cecilia Lumbomirska. She married Don Luis Gonzaga Maldonado y Gordon on June 11, 1962. Princess Isabelle of Bourbon-Parma, the only child of Prince Sixte of Bourbon-Parma (1886-1934)and Countess Hedwig de la Rochefoucauld. Princess Isabelle Marie Antoinette Louise Hedwige was born on March 14, 1922 at Paris. In June 1943, she married Count Rodger de la Rochefoucauld. They were divorce in 1966. He was killed in a plane crash in 1970. She died earlier this month, perhaps, Paris. She is survived by four of her five sons, Sixte Hughes, Charles and Robert, and numerous grandchildren and great-grandchildren. Princesse María Margarita and her sister Princesse María Inmaculada, cousins to the Countess of Barcelona, were charged last year by a Spanish court with tax evasion and money laundering. 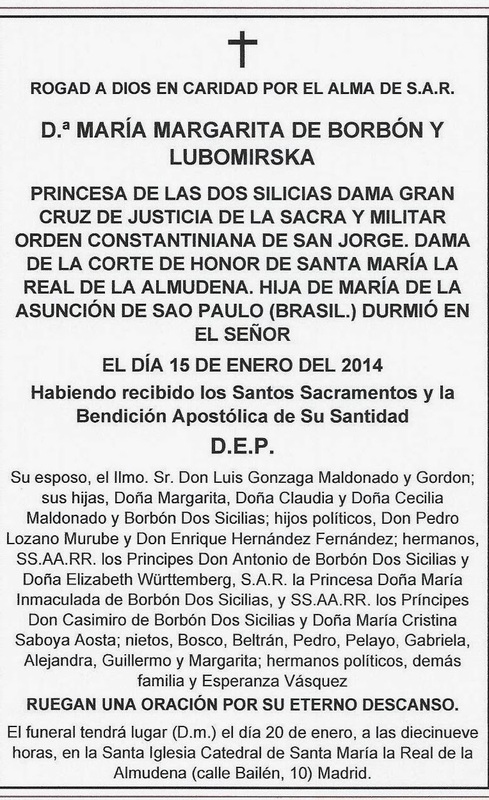 Last Friday 17th it was Princess María Margarita´s funeral. In the morning The Crown Prince Felipe went to offer his condolences to the family, in the evening The Queen Sofia and the Infanta Elena attended to the funeral. On Monday The Queen and The Crown Prince attended to a Mass at the Cathedral of la Almudena, opposite to the Royal Palace. Purely for information. You will be aware Princess Isabelle of Bourbon-Parma died a day or so ago on 26 February 2015. The Musing article was based on incorrect information which was circulating regarding her death last year.